160 year island cottage carefully restored to retain its distinctive character whilst providing modern facilities. Sleeps two plus a child. These four stone-built, slate roofed cottages on Seil are conversions of the old stable, steading and bothy & have 2 to 6 beds per cottage. 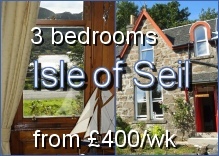 Comfortable well-equipped cottages in peaceful location 20 min drive from Oban. Price includes linen towels solid fuel, heating & electric. Two traditional stone holiday houses with views over Loch Feochan, just 8 miles South of Oban. Free trout fishing. Offering luxury bedsit accommodation for two at £295 per week, this unique property overlooking Oban Bay has a separate kitchen and wet room with toilet. 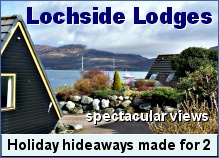 Pine lodges overlooking the sea to the hills of Morvern, two minutes walk from Benderloch village. The lodges have full disabled access. Two self catering properties on a working farm 9 miles south of Oban. Choose from the Cottage or the Studio Flat. Large 5 bedroom farmhouse on the shore of Loch Creran offering comfortable accommodation & modern amenities for up to 10 people. Peaceful chalet on the shores of Seil Sound sleeps four persons in one double bedroom and one twin bedroom. Open plan living room opens onto the decking. 2 individual, one bed, self catering apartments with stunning views over Oban Bay. Choose Rosacre Garden Apartment or Westbay Sea Front Apartment. Traditional Victorian self-catering holiday house with stylish interiors on the outskirts of Taynuilt with views to Loch Etive. Sleeps 8 people in 4 bedrooms. Get away from it all. Choice of four farmhouses on this private island. No mains electricity, but all mod. cons nonetheless. Self-contained apartment overlooking the Falls of Lora, hills and islands. Double bedroom + sofa bed, bathroom & shower. Decking with view. Private parking. Small four-star holiday park on the Isle of Luing featuring seven luxury static caravans on the foreshore. Spectacular scenery, abundant wildlife. Three bedrooms, full central heating, TV, wi-fi, a large garden with bbq and bird feeders, off-road parking for three cars and the Atlantic Ocean on the doorstep. Two 1 1/2 storey, semi-detached cottages each accommodating up to four, furnished and decorated to an exceptionally high standard. Imagine a Scottish island to youself! The farmhouse is the only property on Torsa with easy access. Just 15 miles south of Oban. A beautifully presented three bedroom house set on a ridge in a quiet but central location. Private parking. Two spacious decking areas.